The month is almost over and I haven’t even shared my May Birchbox yet. What a crazy month this has been!!! For those of you who don’t know what Birchbox is, let me tell you. It’s a monthly beauty subscription shipped straight to your mailbox. Each month, the Birchbox staffers will send you a box with 4-5 beauty products to try out; sometimes there are sample sizes included and quite often there are full size products. It’s a terrific way to try new brands, learn about new beauty products and give yourself a little bit of pampering each month. If you are interested in learning more or starting your own subscription, then click here. 1.) Klorane Gentle Dry Shampoo with Oat Milk – I love dry shampoo; next to hairspray, it’s my favorite hair product. And of course, Birchbox gets me just by putting the words “beloved by celebs” in the description. 2.) Marvis Classic Mint Toothpaste – Is toothpaste considered a beauty product? I guess it is, because bad breath does not make someone more appealing! I love the vintage look to the tube and I can’t wait to throw this in my travel bag and use it very soon. 3.) COOLA Cucumber Moisturizer for Face – This smells so good!!! And I love that the moisturizer also has SPF, saving me an extra step in the morning. 4.) Sumita Color Contrast Eyeliner – I usually prefer a liquid eyeliner, but I’m intrigued by Birchbox’s claim that it glides on easily. We shall see. 5.) 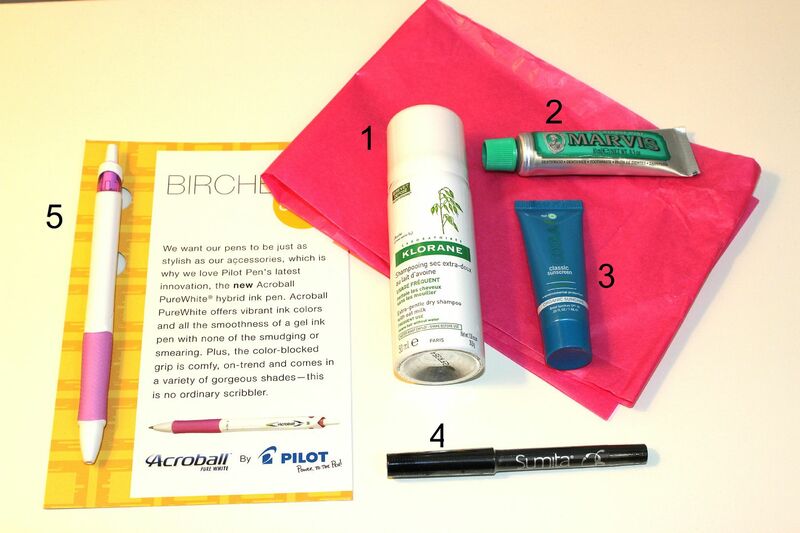 Birchbox Extra: Pilot Pen’s Acroball Purewhite ink pen – Ok, definitely not a beauty product, but a pen is a necessity when you are a blogger or a list maker. And I just happen to be both. So thanks for the little extra Birchbox! 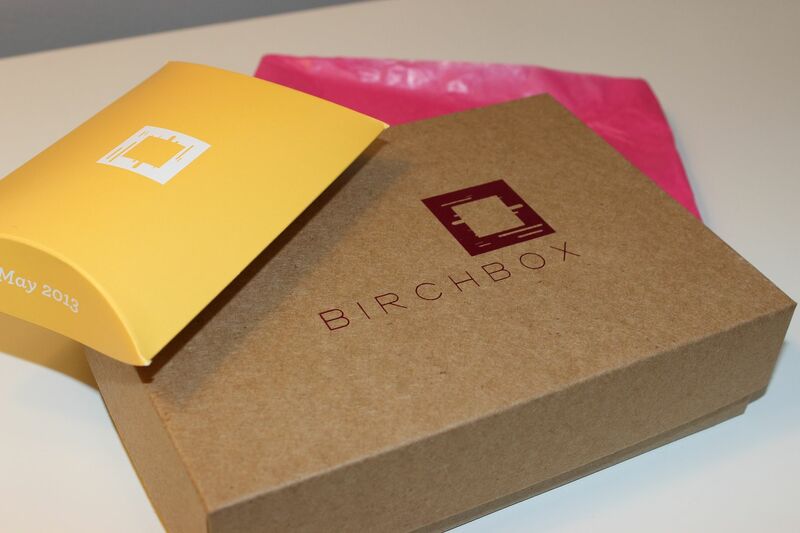 If you subscribe to Birchbox, what did you get in your box? I love hearing about everyone else’s products because it gives me something to look forward to in future boxes. And again, if you are interested in starting your own subscription, just click here. 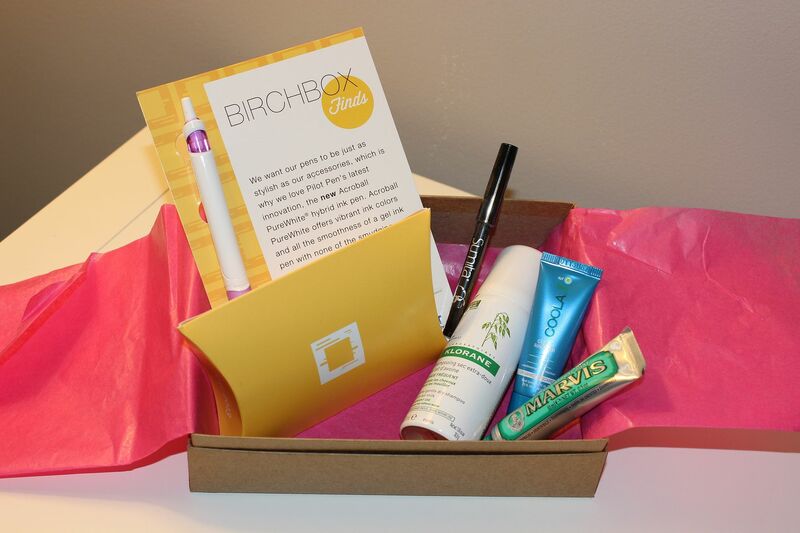 I have my Birchbox in the blog today too! I'm jealous that you got the Klorane dry shampoo - I LOVE that stuff!!! I had heard about the birchbox before and wondered if it was worth it. I haven't posted about my May Birchbox! I got almost the same stuff except I was sent curly hair product. I really want to get a Birchbox subscription!! They look great! Oh man!! This makes me even MORE excited to get my Birchbox! There was a mix up with my address, and have yet to receive it!